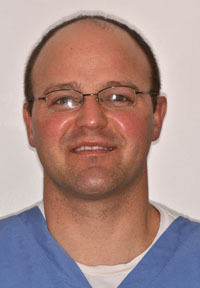 Dr. John Tingey attended dental school at the University of Nevada Las Vegas School of Dental Medicine from 2004 to 2007. In order to become a specialist in periodontology, he completed a three-year periodontal residency at the University of Iowa Dental School. Since graduating, Dr. Tingey has become active in his professional community, often attending seminars and courses through the American Academy of Periodontology, Academy of Osseointegration, Spear Education Summit, American Dental Society of Anesthesiology, and the American and Montana Dental Associations. By completing far more continuing education than is required of him by the state of Montana, Dr. Tingey stays up to date with the newest and best periodontal and dental implant techniques to provide the finest dental care for each patient. Originally from Mesa, Arizona, Dr. Tingey currently resides in Great Falls with his wife and five children. His family means the world to him, and time outside the office is often spent playing and spending time with them. You can also find him working around the house, riding quads, fishing, hiking, and hunting. Dr. Tingey enjoys being outdoors and getting used to being out in the cold—a big change from Arizona’s weather!